We're in the thick of Spring Training, when MLB teams try out lots of players hoping to crack major league rosters. But yesterday, one ballplayer got an especially long look from the New York Yankees. The Yanks signed 10-year-old Landis Sims to a one-day minor league contract. 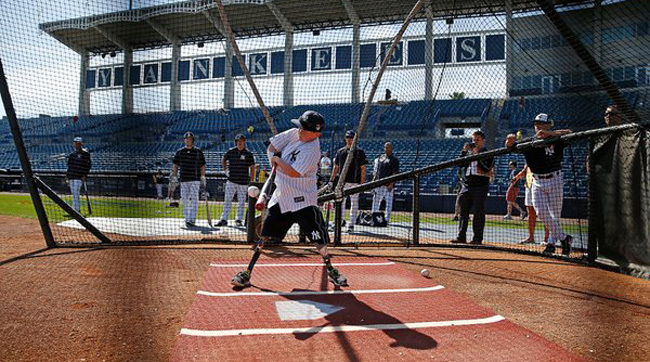 He got a locker at George M. Steinbrenner Field in Tampa, Florida, took batting practice, and worked out and got pointers from Alex Rodriguez. It was every kid's baseball dream come true. But Landis isn't your average little leaguer. He was born without hands and lower legs. But that hasn't stop him from hitting the field. Landis' day with the Yankees began during the team's pre-workout meeting. He signed his one-day deal — with help from ace C.C. Sabathia, who helped negotiate Landis' contract — then met players and toured the clubhouse. From there it was on to the cage, where he took some cuts alongside A-Rod and Mark Teixeira. 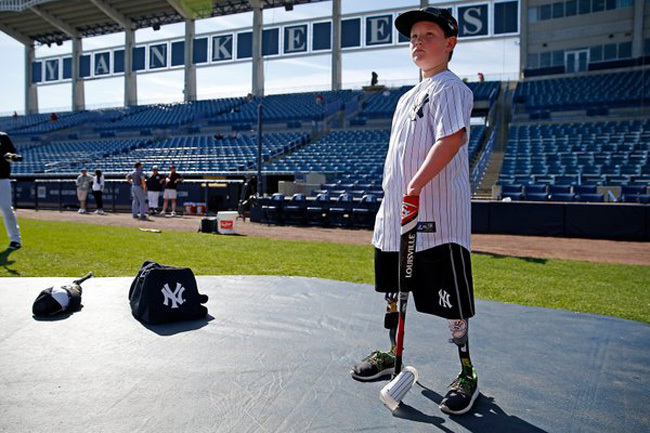 According to a story published on Yankees.com, Landis "is able to bat with the aid of a special prosthetic that cups the bat. On the defensive end, a soccer shin guard is inserted into his glove." This setup is how he's able to play Little League Baseball back home in Indiana. By all accounts, everyone at Yankees camp — from the players to the coaches to the front-office staff — were moved by Landis' visit. "The guys, I applaud them," Girardi said. "They were great with him. He hit. He had lunch with us. He was part of the meeting in the beginning. He’s a special kid." The one player who really connected with Landis, though, was Rodriguez. They hung out in the clubhouse, on the field, and during batting practice. At the end of the day, the superstar gave Landis a bat and signed it, "To a great teammate." "So grateful that I got to spend time with Landis Sims today," Rodriguez tweeted. "A true inspiration."